If you’re like me you had your TV tuned to football on Sunday night watching what turned out to be an historic Super Bowl and a great night for the City of Houston! I want to congratulate Houston for putting on a fantastic event. A lot of folks might not realize that the Super Bowl is more than just the game. In fact 140,000 visitors were treated to 9 days of festivities and fan events. 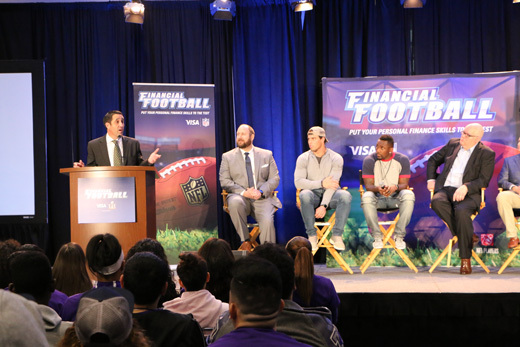 I was fortunate enough to have an opportunity to join with Visa, the NFL, BBVA Compass, and the National Jump$tart Coalition to promote financial literacy at a very special event for some Houston ISD students. On the Friday before the big game, two teams of Houston ISD students got the chance to join NFL players Brian Cushing and Thomas Davis to play a game of Financial Football. The game was developed as a fun way to teach kids about the importance of financial literacy and the need to make smart choices early in their financial lives. It was a fantastic event, the kids loved it and I really think everyone who attended came away knowing that teaching financial literacy to our kids is not an option; it is a necessity. Learn more about the game and the importance of financial literacy here. Even in the middle of all that Super Bowl hype, the Legislature continued to work toward addressing the issues facing Texans and crafting a balanced and fiscally responsible budget. ANY discussion of the budget must include a discussion on healthcare spending. Healthcare spending represents a significant portion of the Texas budget. In fact in fiscal year 2015, our state spent a total of $42.9 billion on health care, representing 43.1 percent of all fiscal 2015 appropriations.That’s just what your state government spent on healthcare. That money comes from a variety of sources, but ultimately these are taxpayer dollars. Whether they come from state taxes or federal funds, the dollars originate with taxpayers. That’s why I want you to have a chance to see this report as well. The Legislature asked my office to provide them with key information as they consider how to manage health care spending the the coming biennium and beyond. The report provided by my office examined health care-related spending by 68 state agencies and higher education institutions from fiscal 2011 through 2015. The report includes an analysis of all state government health care spending and an in-depth look at the five state agencies reporting the largest share of that spending — the Texas Health and Human Services Commission (59.1 percent), the Department of Aging and Disability Services (11 percent), the Department of State Health Services (4.9 percent), the Employees Retirement System (4.4 percent) and the Teacher Retirement System (3.1 percent). Together, these agencies accounted for 82.5 percent of all state health care spending in fiscal 2015. The report also features a section on health care spending by counties, which play an important role in health care delivery and have also seen escalating costs. in fiscal 2015, Texas spent $42.9 billion on health care, representing 43.1 percent of all state appropriations. from fiscal 2011 to fiscal 2015, state health care expenditures rose by 19.7 percent, a rate exceeding the growth of both inflation and the Texas population in the same time period. in Texas, health care spending represents about 12 percent of gross state product. For more information and to view the full report please click here. This is an important issue and one you should follow closely as the legislature deliberates. As always my office stands ready to assist lawmakers and our strong conservative leadership in the Legislature as they work toward a fiscally sound budget. I hope this note has been informative, and if you know of a friend or family member who would enjoy these updates, please forward this along. Please let them know they can sign up here to get these updates sent to them directly.